Yantras are great cosmic conductors of energy, an antenna of Nature, a powerful tool for harmony, prosperity, success, good health, yoga and meditation. Yantras are usually made out of copper and consist of a series of geometric patterns. The eyes and mind concentrate at the center of the yantra to achieve higher levels of consciousness. 'Luck' is an element of positivity that drives success, happiness and prosperity into your life. The bracing breeze of luck can bring you volumes of money, comforts and gains when you make it blow in your direction, and the Dhanakarshana Yantra can do that for you! This Yantra can shower you with the blessings of Goddess Lakshmi, an embodiment of wealth and prosperity. She can bestow material comforts and good luck. She can sweep away your misfortunes and fill your living space with good fortunes and spirits. Experience an increase of luck in your life! 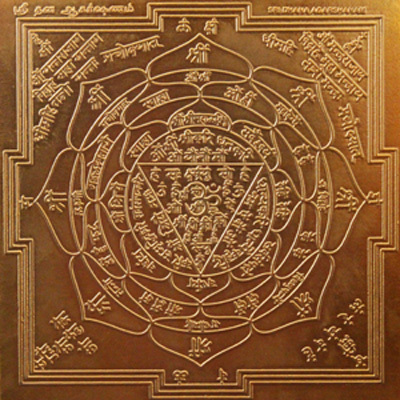 This Yantra magnetizes wealth, material comforts and prosperity toward you. Goddess Lakshmi, consort of Lord Vishnu, blesses her devotees with riches and luxuries. She is considered the lucky Goddess who brings in opportunities to multiply your comforts and gains. This Yantra is energized with her power and when you use it, you have the potential to be blessed with the capacity to earn more money. • Place the Yantra facing the East or the North on a clean and sacred altar. • Do not let other people touch the Yantra. • Periodically wash the Yantra with rose water or milk. Then, rinse it with water and wipe it to dry. The Yantra’s color may change over a period of time; however this does not dilute the power of the Yantra. • Place rounded dots of sandalwood paste on the 4 corners and in the center of the Yantra. • Light a candle or ghee lamp and an incense stick in front of the Yantra. You can offer fresh or dry fruits as Prasad, as well. • Chant the Mantra above in front of the Yantra, preferably after you have showered. • Business owners who desire to realize their business goals. • People who suffer from losses and wish to turn that around. • People who wish to increase their inflow of income. • People who yearn for material comforts. • People who desire surplus to share with others. Lakshmi Kubera Fire Lab- This Fire Lab is targeted to bless you with luxuries, financial growth and success. It can amplify your sources of income, and hindrances blocking wealth accumulation can be overcome. Lakshmi Kubera Yantra - Embellish your Life with Luck and Luxuries! Why Lakshmi Kubera Yantra? Lakshmi Kubera Yantra is a red carpet welcome to money, wealth, good fortunes and prosperity! Lord Kubera and Goddess Lakshmi symbolize material wealth and riches. When you worship them, you will be gifted with all luxuries and riches. The power lines of the Yantra can sweep away your misfortunes and pour monetary gains into your life.